New York, USA -- On July 1st, the top post on the ID Project’s Blog proclaimed: No More Plastic Bags Y’all! We are going Back to the Sack! << The ID Project offers a grounding sense of community in a fast-paced metropolis. Photograph by Emily Rose Herzlin. Where’s your plastic bag stash? Everyone has one. It’s a kitchen cabinet or a drawer stuffed to the gills. It’s a corner of the hallway closet. Better yet, it’s a plastic bag filled with plastic bags. One New York City meditation center, The Interdependence Project (ID Project), has taken on the environmental issue of plastic bags as part of their ongoing effort to connect their meditation practice to their everyday lives. July 1st marked the start of their Low Impact Consumption Month and “Back to the Sack” initiative to eradicate plastic bag usage in New York City. The ID Project is right down on the Bowery, just before Houston Street, through a door with a newly fixed buzzer, and up a creaky two-story walk-up with an overflowing shoe rack (visitors must be barefoot to enter the meditation room). The space glows with diffused light from the peach walls, like wisps of clouds. Four large white Chinese lanterns hang from the ceiling like moons, reflected in the shiny planks of chestnut wood on the floor. A circle of colorful Mexican blankets give rise to a community of meditators. The Bowery hasn’t gone away, it’s still just two stories down and comes in through the room’s four windows with each blaring car horn - which we notice, acknowledge, and then return to our breath and the moment, which will soon be gone. For the past three years I’ve attended classes at The Interdependence Project, a meditation center and non-profit organization in Manhattan. Always greeted with a smile from any number of the ID Project regulars, I often find the Executive Director, Ethan Nichtern, wise for his mere 30 years, darting around the space before class, setting up cushions, answering questions, and getting to know as many people as possible. The attendees wear jeans, work clothes, or whatever they had on ten minutes before they came. This is New York City – everyone’s on the go. Buddhism has always been more of a philosophy and moral code for Ethan, rather than a religion. Ethan grew up practicing meditation in Manhattan, which any metropolitan meditator knows is a journey all on its own. “It’s interesting to try to do an inner development practice while living in a city of 8 million people that is the media and culture capital of the world,” Ethan muses. Ethan found a common sentiment among his fellow meditators that there needed to be less of a split between meditation and “real” life. “Meditation alone is not the way to get enlightened,” he says, “you can’t just sit there and develop these qualities (mindfulness, awareness and compassion). In all the teachings on meditation, you’re instructed that you have to apply these qualities to what you do in your life, but they don’t say a lot about what specific things to do.” Thus the ID Project, with its three main prongs of Meditation, Arts and Activism, was formed. Cassie Mey is the Integral Activism Coordinator at the ID Project. On Sunday, June 29th, Cassie arranged a meeting to plan for their first big activism project, “Back to the Sack,” as well as their July Low Impact Consumption Month. The long-term goal of the project is to help eliminate plastic bag usage in New York City in the hopes of interacting with the environment in a positive way. Also in attendance at the meeting were New York State Senator Eric Schneiderman, a progressive democrat and meditator, and legislative analyst Marcy Palmer, also a Buddhist practitioner. Senator Schneiderman teamed up with the ID Project to aid them in their “Back to the Sack” initiative, providing his knowledge of how the political system works. Senator Schneiderman and Ms. Palmer led the group through the city and state’s current legislation on plastic bags: The most recent bill requires that large stores (stores greater than 10,000 square feet) take back plastic bags and set up recycling bins for them. There are even fines for stores that don’t set up the program. This sounds like a step in the right direction, but the problem with the bill is, as the Senator explained, that it’s actually a step backwards since it overrides city laws. Most New York City stores are smaller, so they’re not required to implement the recycling program. This bill applies mostly to the Targets and the Kmarts, which are not prevalent in Manhattan. “We should focus our lobbying efforts to urge the Governor to veto the bill,” Senator Schneiderman suggested. But why not just be eco-friendly? Why do we need to meditate? “It’s like asking the driver of the Titanic to steer clear of the iceberg without giving him driving lessons; you have to learn how to navigate your mind if you want to navigate the external world,” Ethan says. Mindfulness is, simply stated by Ethan, “the ability to place your attention on what is happening now, rather than having your mind go off into fantasies and nightmares and what you wish was happening.” Learning to be present is no easy task. We’re all conditioned to worry about the future and to try to control our world. What would happen if we relaxed our grip and allowed ourselves to rest with reality? Would everything fall apart? Mindfulness takes time to cultivate; they don’t call it a practice for nothing. Low Impact Month is a chance to get to know our minds as we react to not being able to use plastic bags through July. The desire to have something as convenient as a plastic bag for groceries is very strong, and is fascinating to pay attention to. “There’s a reason plastic bags came to be,” Ethan explains. As a start for Low Impact Month, the ID Project recommends getting your hands on some reusable canvas or parachute bags, which are relatively inexpensive and can be folded up to fit inside a purse or even your pocket. Visit their website for suggestions and tips on how to participate. Emily Herzlin has been a member of the ID Project since 2005. For the Low Impact Consumption Month she is giving up plastic bags, plastic water bottles, and red meat. The ID Project is located at 302 Bowery, Buzzer #2, New York, NY. Classes are offered Monday through Saturday in addition to weekly arts groups in areas ranging from Visual Art to Writing to Performing Arts to Knitting. 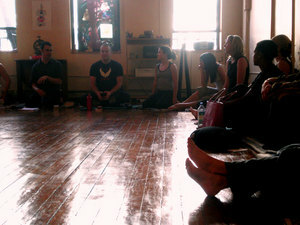 The ID Project also offers guest lectures and day-long meditation retreats. For those not able to make it to Manhattan, there is a regularly updated Blog and a weekly Podcast (also available on iTunes). Check out their website for more information: www.theIDProject.com. Also look for Ethan Nichtern’s book, One City: A Declaration of Interdependence.